Hi everyone, I'm serious about creating a dynamic smart light solution to better regulate my sleep cycle for early mornings - I'm a night owl from Toronto, Canada and need to simulate my big exam on April 22 that is in the morning, I want to be alert at 7AM for daily studying until then! Ideally like to automate light dimming and color change by integrate with IFTTT. It's pretty much a DIY Ario Smart lamp (pre-order is $299 - forget that!!!). @adamlogan Did you end up figuring out a better setup than Philips Hue + Huemote? If anyone could provide their thoughts on what I should do - please share! the last bulb in a new secondary light source in my room (any specific recommendations? 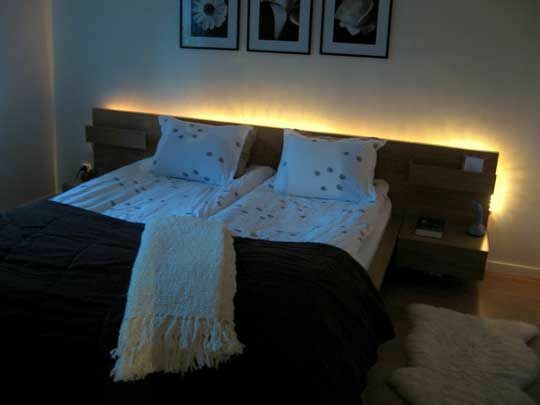 maybe a lightstrip along my bed like the one below) I'm willing to invest into a setup if it can meet my goals. I don't mind lights that come on too bright in the morning (I'm also planning on buying thick black curtains to block the street light pollution since I'm only on the 7th floor so I'll need something bright in the mornings to counter the lack of sun), it's important for me that they simulate a long dimming animation/transition for sunset. Maybe I could create a cross-transition between two light sources? For example, have TWO hue white ambiance light bulbs A19 in the ceiling position that dim in the evening and eventually turn off before sunset + ONE secondary light source that simultaneously dims down white like the other bulbs BUT slowly turns on a yellow>orange>red light throughout the evening past sunset (praying I can do this all on IFTTT) and maintains <2100K on <10% brightness. I'm also curious if there are any compatibility tricks that I could use (i.e using a Philips Hue Bridge with other bulb brands). I understand pairing with f.lux isn't available for Mac yet. Finally, I've read LIFX bulbs have superior dimming capabilities, the colors are slightly more intense and can integrate with IFFTT (not HomeKit). Please let me know what improvements it needs and I'd be happy to make them if they aren't too difficult. Sleephopeful: Did you end up figuring out a better setup than Philips Hue + Huemote? Unfortunately no, I'm not aware of a better halfway-affordable solution that is available at this time. I'm still using my Gen 1 Philips hue with one bulb waiting for a decent solution to come on the market that I'd be willing to invest heavily in. Svet, Soraa (formerly known as Helia), and Silk Light are the most promising so far but are all still pre-orders. My current solution is to use a Black Diamond Storm headlamp when it gets dark when I need to leave my room or for when I want to read at night. This headlamp is pretty epic. The powertap feature lets you switch between different light intensities with a tap, this even includes the red led which is dimmable, and the lighting is even (no weird bulls eye target rings). My only wish is that it used double A batteries instead of triple A batteries. I've covered up all my electronic's led bulbs with black electrical tape which helps a lot. The most recent change for me was purchasing a boom style floor lamp so I have a light source directly above my head. So far light and heat are the most reliable ways for me to wake up. Earphones often fall out of my ears when I wake up, and since I am deaf, the volume needed using speakers would have to be disruptively loud to my roommates. For me, the biggest battle is to get out of bed at a reasonable time. I think becoming sleepy at night will solve itself dependent on getting out of bed at a consistent and reasonable time in the morning. For my next project, I'd like to use a Wemo electrical switch or something similar to turn on a massage heating pad which I use on my bed, ideally cranking up the heat to levels that would wake me, and if necessary, on to uncomfortable levels to force me out of bed. My current massage table warmer would not work with it as it has a controller between the electrical outlet and the pad. The controller is not dumb enough to just work when electricity is supplied and not smart enough to work with the internet of things. The controller might be hackable or replaceable, although I have next to no experience with electrical wiring or hacking / modifying hardware. I might have to buy a different massage table warmer. Anyways, I'm getting way off-topic, but maybe this will give you some more ideas on possible solutions you can implement. A multi-pronged approach is best IMHO. Hopefully we won't need such a mishmash of hackey gadgets in the future. Keep us posted on what works and doesn't work for you. I think Philips Hue with SmartThings using the Circadian Daylight SmartApp can pretty much give you what you want. You can set your preferred color temperature range, dynamic brightness range, including a sleep mode that will set bulbs to 1% brightness at <2100k. You can even set specific times for sunrise or sunset. You can use older/cheaper gen 1 hardware for both Hue and SmartThings so it's fairly low cost too. I have my entire home setup to use this and it works great. Both color temperature and brightness is automatically adjusted once setup. I take it you're referring to the Samsung SmartThings Hub? Thanks for sharing.